This page is in the process of being migrated. It's new home will be matterhackers.com/mattercontrol/support/printer-controls/index. The CONTROLS pane as seen in MatterControl desktop with a few blurred-out custom Macro buttons. The CONTROLS pane is where available manual controls can be used and adjustments can be made during prints. 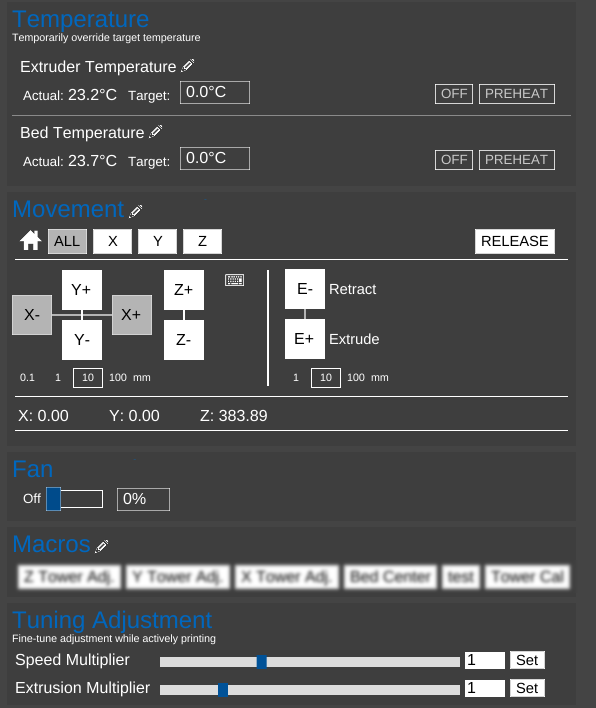 Temperature Controls for the extruder(s) and heated bed (if present). Manual movement controls for the nozzle and extruder(s). X, Y, and Z movement controls switch to fine adjustment during prints. Manual control of layer-cooling fan speed. If the printer's controller board supports it, and if enabled through Printer settings, this section allows for direct control of the printer's main power. The Macros section is for saving snippets of G-Code as easy-to-use buttons. The image on the right has a few examples, blurred as they may be since those particular buttons are not included with MatterControl by default. Allows for manual adjustment of speed and extrusion during a print. Allows the user to update an Arduino-based printer's firmware from within MatterControl. This page was last modified on 4 September 2018, at 11:57.